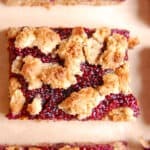 A healthy dessert recipe for berry crumble bars, made completely gluten free and vegan so they are perfect for all diets! Using real fruit and no refined sugar, these bars are perfectly sweet with a delicious almond flour oatmeal crust. Preheat oven to 350F and line an 8×8 baking pan with parchment paper or nonstick spray. Warm berries, lemon juice, and maple syrup in a saucepan on medium heat. Continually mash with fork or potato masher until berries are bursting. Turn off heat and add in chia seeds. Stir and let cool completely, putting in fridge for 30 minutes, allowing the mixture to firm up. In a bowl, combine almond flour, oats, baking powder and salt. Add in maple syrup and almond butter and stir, feel free to use your hands to make sure everything is blended completely. You should be able to pinch the mixture and have it stick together. Save a heaping 1/2 cup of dough to the side and flatten the rest into the 8×8 dish, pressing down firmly on the bottom. Set aside. After jam has chilled in fridge, pour berry filling over top of crust. Sprinkle remainder of topping evenly over top of filling and bake for 35-40 minutes or until golden brown.